A cruise along the backwaters of Kerala is one of the quintessential travel experiences in southern India. The Malabar backwaters are a vast network of lagoons, lakes, rivers and canals between the Western Ghats and the Indian Ocean. Fringed by lush tropical vegetation, small traditional villages and rice paddies, a slow meandering cruise allows you to witness Keralan village life and appreciate the stunning landscapes. You'll pass pearl divers fishing for oysters, coconut workers on the shores, rice barges and other traditional vessels. 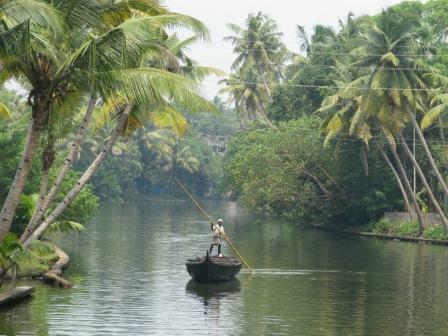 There are two main options for exploring the backwaters. You can hire houseboats, converted from kettuvallam (or rice barges) and made from Anjili wood and bamboo, which are up to 25 metres long with full amenities and a crew of three of four and will cruise for several days between Kochi and Kollam. Alternatively a quicker and cheaper option is taking a modern vessel that sails for eight hours on the main Kollam to Allepey route. Organised group tours: Click here to see 21 tours to South India which may include Kerala Backwaters.